In a previous post, readers were introduced to You can call me anything. I’m feeling teary-eyed and nostalgic today so this entry will cover This about that as mentioned elsewhere in my wide web of wordiness. From what I’ve acquired from my late father’s Muskoka’isms, it is idle chatter, small talk filling in the silence, the void between two physical beings. In some way though, the chat would bring us to some deeper subject, some connection to our lives, those of others and how they intertwine during our short performance on this beautiful theatre in the round. “Well, it’s nice to hear this about that,” my dear old Dad would chime from the other end of the telephone. 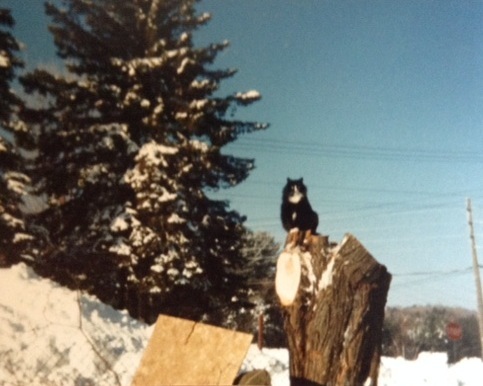 After his passing away in 2001, I missed our monthly chats with the kids piping in to talk with him and ask about Sylvester, my old, fat cat who still resided at the homestead. I miss my Dad and his small town ways, his slow saunter through his village, his soft heart, his stories and his lush, experimental gardens. 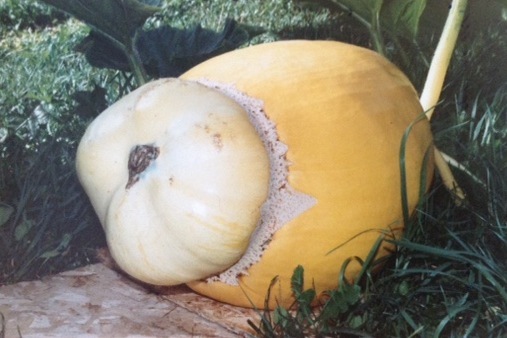 Giant prize pumpkin circa 1986. These things reminded me of the “pods” in Body Snatchers! I miss those simpler times when there was no super information highway, no shameless theft of intellectual property or electronic scams, spams and phishes. The only phishes we knew were the fishes he tried to catch through a hole in the frozen Muskoka lakes and bays. 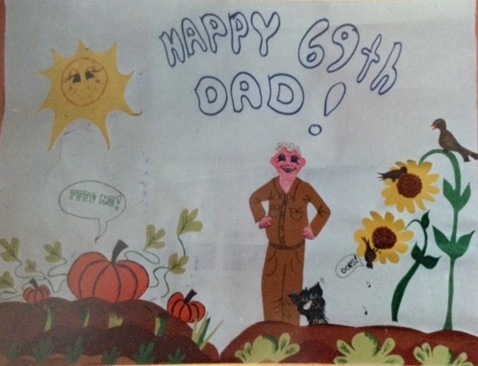 There were walks to the post office, the corner store, chats with neighbours and porch chair sessions in view of the intersection, the towering sunflowers, busy bird feeders and the hungry, hungry giant pumpkins. THAT was interactive. You can read ten years’ worth of This About That posts under my different names of days gone by, and witness the birth and evolution of my novel, The Year of the Rabbit. You can obtain an electronic sample from my publisher. You know that embarrassing situation when you forget a person’s name? How about as a parent – have you ever chided one of your offspring in the wrong name by mistake? Imagine the frequent, frustrated outbursts from a mother of 11 kids! This episode of Muskokaisms introduces “You can call me anything”. In The Year of the Rabbit, Father Gio faced a social stressor when wanting to address one of the Fletcher twins. You can read an excerpt here. Catch you next time. Thanks for dropping by. In the previous post we learned about the financial risks of giving canaries to cats. This week we explore the Muskokaism (or Dadism) of Much in what you say. We used to hear Dad use this expression often in a conversation with someone who seemed adamant in getting a point across. I think it was Dad’s way of acknowledging their opinion yet maybe just wanting to politely end the conversation soon. If words changed anything, they would be illegal. “By continuing the process of inflation, governments can confiscate secretly and unobserved an important part of the wealth of their citizens.” - John Maynard Keynes, writing about the effects of a seemingly small amount of inflation every year. Recreating family history one piece at a time. CBT - starting points for everyone. Cognitive behaviour therapy. Cognitive behaviour therapy tools. CBT success stories.